JBL SB 350 review | What Hi-Fi? 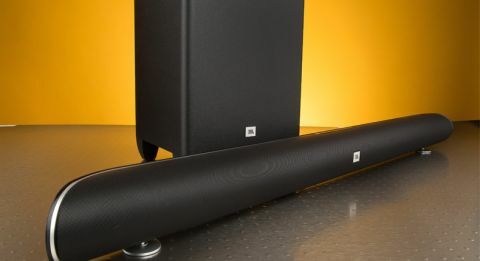 JBL has given us some gorgeous soundbars in the SB 200 and SB 400 – and the SB 350 is yet another knockout. It might be just another long black bar, but its tasteful silver trimmings and stylish semi-cylindrical body make a world of difference. It oozes quality, and would easily pocket the full five stars if it were all about looks alone. Underneath its curvaceous metal-mesh front are left and right speaker modules, each with two 5.5cm full range drivers and a 3cm dome tweeter. Usually the absence of a text display is a pain, but the fact that buttons light up to indicate simple functions (like changing volume and input) softens the blow. More complex instruction from the remote, like changing sub levels for example, relies purely on guesswork, though. The remote is poor for the price of the package. The credit-card design is something we’d usually forgive for a lower price tag, but not for £350; we’d take full advantage of JBL’s claim that the SB 350’s volume can be controlled by ‘any’ TV remote instead. With two circular feet hoisting the bar 8cm high, the SB 350 just about manages to sit beneath our TV screen. Its slim body doesn’t require much space in front of your telly, though the bar can be wall-mounted, too (on the back of the bar, you’ll find an equalisation switch to optimise performance for placement on a table or wall, which we recommend). Also found at the rear is an optical input, 3.5mm mini-jack and HDMI ARC output, for a passable connections list. Don’t get too excited about the USB socket though – it’s for firmware updates only, however, like on most soundbars, it doubles up as a wireless music speaker thanks to built-in Bluetooth. The partnering subwoofer is relatively non-descript, although it racks up points for its practical, compact build. Sat upon four feet, the sub boosts the bar through a down-firing 16cm woofer. There’s also a phase switch onboard, and a button to manually pair it to the bar – although it connected automatically nine times out of 10 in our test. When it comes to performance, one of the SB 350’s biggest draws is its big, dynamic profile: ideal for blockbusters like G.I. Joe: Retaliation. As we once again root for the Joes facing their archenemy Cobra, the soundfield throws you right into the action; fight scenes fill the room with sounds, and it’s immersive and crammed with detail. The soundfield has precision: you can track every shard of glass as it splinters in slow-mo. Balance could be upset during the lengthy ninja battle scene, as trebletastic metal-on-metal effects burst onto the soundfield. But the SB 350 remains cool, calm and collected, showing not even the slightest hint of a hard edge; clashing swords have bite, but they are never piercing, for example. The sub delivers, too, with a generous bass, although we’d turn it down a few notches to even things out tonally and expressive dynamics make the fast-paced score all the more exhilarating (turning on ‘Harman Volume’ mode prevents sudden jumps in volume, which is handy if you are watching at night, however). The SB 350’s midrange is clear and it’s only drowned out if you turn on ‘Virtual Sound’ mode. Voices aren’t as insightful or well projected as on the Philips HTL5140 (£270), while you can pay £50 extra for our Product of the Year, the Q Acoustics Media 4 (£400), and get plenty more solidity and expression in the midrange. Still, the SB 350’s performance has a lot going for it, with movies and music alike. Stream Lorde’s Royals from a Google Nexus 7 tablet and its wide soundstage is packed with detail and conjures a precise picture of the instruments. There’s a good sense of clarity and drive to the bassline and clicks – even when we streamed a low-res file of the song from Spotify. Ultimately, stiff competition prevents the SB 350 garnering a fifth star: the class-leading Philips HTL5140 (£270) and Q Acoustics Media 4 (£400) both give better performance-per-pound. Still, the SB 350 has plenty to praise. Its show-stopping design is exactly what you’d want in front of your telly, and with a decent sound that’s big, dynamic and detailed, it grants movies the thrilling and immersive quality they (and you) deserve.